When it comes to trying something new on the web, I'm all about keeping the amount of time I invest insanely low. This is probably why I use CakePHP, it lets me build web apps very quickly and minimize the risk in case they fall on their face when I launch them. LinkBlip is exactly one of those types of projects. I built this app from start to finish in a little under 4 hours. The concept is really simple: it's a way to monitor when someone has clicked a link you sent them. Have you ever sent someone an email and never heard back? 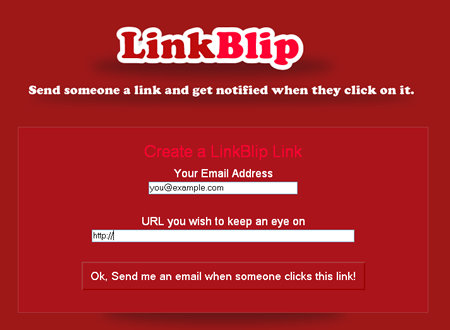 If you send them a LinkBlip URL, you'll automatically be notified by email when they click on it. It also tells you what city and state they were in when the clicked the link. It's basically like an email receipt, although less annoying and you don't know it's happening. Plus you get to see what city and state they're in. Making it crystal clear what LinkBlip was and how it works. If users are going to commit to the idea they need to understand it first. I tried my best to outline LinkBlip in plain english without overloading the copy. Make it easy to bookmark for later use, because although many people could find this useful they probably aren't going to need it the first time they visit the page. It's the kind of thing you'd refer to later. Feel free to post any feedback or suggestions in the comments. Interesting concept and a handy tool for the belt. One of the most important tools in internet marketing. Why can't the URL be something like http://example.com? Why does it have to have a third level domain (http://www.example.com for example)? Hey Matt, thanks for pointing that out, it's fixed now. It was actually a bug in CakePHP, the web development framework I use. Great concept! I would love to have the source code if possible to learn from it... would you consider making it open-source? Great idea. Why didn't I think of that?! Is there a way to receive a notification every time the link is accessed? Right now it looks like the user is only notified the first time someone follows the link. Ok, great idea but I was notify but it didn't show from where someone clic my blog. Very interesting, tons of potential. I posted a link in Twitter and it was clicked in about 5 seconds. I sent the link to myself and when I clicked on it, I received an email saying someone from Philadelphia, PA clicked on the link, but I'm from St. Louis, MO !!! Otherwise, EXCELLENT idea! great tool however I am in Sydney Australia and in testing it shows that someone from Mountainview CA clicked on the link. Can you find a way to place a cookie in the site so it at least holds the senders email. I know I'm savvy enough to understand how it works, though I was trying to think what exactly this line was saying: "ok send me an email when someone visits the above URL" while the only URL above that submit button was the one i just inputted. A more intuitive text to that submitted button would be "Generate your LinkBlip now!" just a suggestion, anything else is a true masterpiece. brilliant. Great tool for marketing. To make it even better is there a way to capture the email address? how about a bookmarklet for this service? This is brilliant, but tells me I'm in London, when actually I'm in Leeds! Hey everyone, thanks for all the feedback. Regarding the inaccurate locations, this isn't something I can control. We use a 3rd party geoip database. The rest of the features I'll definitely look into. I want to add multiple URL tracking and the ability to be notified every time someone clicks a URL, not just once. Unfortunately I'm gonna keep the code to myself for a time being :) It's actually not that complex, anyway. I use CakePHP, so all the repetitive tasks are handled by the framework. The rest of it is just some basic IO combined with GeoIP targeting. A clever programmer could re-produce this very easily. 02. Login where you can view all results from all your links - when, how many, who.. etc. 03. Coz autogenerated links is based on your domain, maybe is not bad idea to generate BB & HTML code, like [URL=http://lburl.com/3eifo]http://google.com[/URL] to make the visible link more real. Who wont to post it to html site or html e-mail or just some bb based forum, to be able to do that elegant :). It would be great to get a text message every day with stats! Check out our Mozeo Platform, we have a free API with ad support and a Paid API. It works even in Denmark. It could be very helpful and possible if you could supply with the IP address from where the "click" came from. William, I considered making the recipient's IP address visible, but I decided against it for fear it was too invasive. Great idea. Tested it and it worked well, however my goegraphical location was way off. Is this for the USA only??? please also mention how to stop it ???? Is there a way to omit or disguise the "lburl.com" from within the Linkblip-generated URL? Anyone who may be the least bit curious about the link in their email would Google lburl.com and would quickly see many examples of lburl.com being referenced back to linkblip.com. This might make them reluctant to click on the emailed link once they realize that it would be monitored. "How it can be disabled from sending email"
It should only send an email once, so after the first click you won't get anymore emails. This is an awesome idea, as most "Why didn't I think of that?" things are. Good luck in selling it, you deserve to be rewarded. how many times does it work? "This link was clicked 1 hour, 16 minutes ago by someone from , ." In other words, the information as to place was cut off. Also, it would be helpful if the IP address was also shown. Very great, as always common and simple things are the most genial ideas.Just a question, if i want to see (in the mail that u send to me once the contact as clicked) the e-mail of the contact is possible? In that way i will have full trace of what i want. i think it wuold be easy to tell the program "give me the string of the e-mail adress of the recipient", or not? **EVERY TIME** is the key! It does not show the geografical location neither person's IP. I would be happy to use it if it'll work properly, but not as it works now. Also - it would be useful if reports being sent every time someone clicks the link, not only once when first person access My link. I'm sorry... maybe next time. please create a feedflare for it, so we will be able to use it in conjunction with feedburner "email this post" feedflare. Very nice!! I love it. It's simple but useful!! Also check out SpyPig.com -- a free email tracking tool that lets you know when your email has been read by the recipient. I really like this concept and was planning to use it. My only concern is that the URL's I currently send out have the articles name I am referencing in it and the LinkBlip URL is to vague. I am worried that people will not want to click on a link. It almost looks a little like spam and I am not sure that I would click on a link like that. Great idea though...I just have to figure out how it can work for me...thanks! i created a link in linkblip and now i want to edit or delete it. it's very important for me. please say me how to do it. "...If you're interesting in buying, please email me: oatmeal@gmail.com". [b] We Offer viagra For Lowest Prices on the WEB. great website. you can also check http://www.getnotify.com. It is a Free email tracking service which notifies you when your sent email gets read.